In a perfect world, we wouldn't need Neosporin. No knees would be scraped, blisters wouldn't break, papercuts wouldn't get infected. Kids wouldn't scratch bug bites with dirty nails. In our home, however, Neosporin is a pretty frequent necessity! Its triple antibiotic formula kills common skin bacteria and provides long-lasting protection from infection. It promotes quicker healing and helps to minimize scarring, too, both of which are great if you have accident-prone little ones. Or husbands. We keep Neosporin Original Ointment on hand all the time, but Mom Central and Johnson's asked me to review a couple of Neosporin items I didn't know about, I was happy to oblige. Neosporin +Pain Relief is available in ointment and cream varieties and contains a topical analgesic for quick, temporary soothing of minor cuts and burns. Which is nice for keeping the whining and moaning to a minimum. Neo To Go Spray is my favorite new purse accessory. It's a tiny, non-aerosol spray version of Neosporin that makes it easy to disinfect and protect nicks and scrapes on the fly. It was actually engineered to be used one-handed, which I find ingenious. And the little gizmo is darned cute, too. 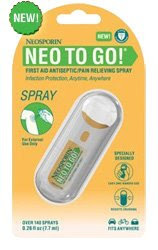 I've already used it a couple of times and I think it's actually easier to spritz Neo To Go Spray on a wiggly kid than the tube of Neosporin Original Ointment. I wish I had one of those Neo-to-go packs when my boys were toddlers and preschoolers. Goodness knows we had our share of scrapes. I used to keep a small tube of the stuff in my kid bad, this new stuff is great for traveling light. I love love love Meosporin! Really my grandpa was obsessed (think the dad in Big Fat Gree Wedding with windex) so it is a family favorite!